Welcome to Cafe Cala. 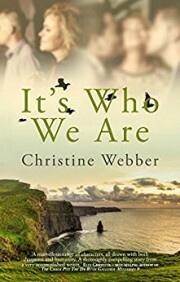 This year I plan to interview authors who have chosen, like me, to write about older characters and I’m delighted to start the year by wecoming back Christine Webber who first appeared on my blog in 2016 with her first novel Who’d Have Thought It? Christine is offering a giveaway of her new novel, It’s Who We Are. To be in the draw, just comment below. The winner will be drawn Thursday Feb 1st. Welcome back to Café Cala, Christine. I love your writing and the fact that, like me, you choose to write about mature characters. I feel honoured to have been permitted to read an early copy of It’s Who We Are which I loved. What made you decide to feature older characters in your books? I’ve had my fill of writing for – and about – 35-year olds. My first novel, way back in 1987, had a lead character of that age. And most of my non-fiction books – self-help titles in the main – were pitched at that age group. Then, in my psychotherapy practice, the bulk of the patients were in their mid-thirties. But nowadays because – like you – I feel that older people as lead characters are very much under-represented in literature, I just want to write about individuals in mid-life and beyond. It’s Who We Are is an ensemble piece which follows five characters. What were the challenges you experienced writing it? Previously, I’d only tackled fiction from one person’s perspective. It’s Who We Are proved to be much more complicated! I started by allocating one chapter to each character for the first five chapters. Then I opted to repeat that process for Chapters Six to Ten. I felt that this was the best way to establish each of the five protagonists – who they were, what they were going through and how their minds worked. But from Chapter Eleven, I switched to writing from a less specific angle. By that part of the book, the characters have all met each other, and they become a group of close friends as the story unfolds. However, there’s no doubt that an ensemble piece is very challenging. I think it’s a bit like a fugue in classical music, where every part must have equal prominence and retain its own melodic line, while combining with others to form a rich harmonious whole. I really had to battle with it at times. And I regard myself as very much a novice in this area. But I felt compelled to write the novel in this way – so I learned as I went along! You have both male and female main characters Do you find it easier to write one or the other? Funnily enough, I didn’t think about this very much. I attribute this in part to my years as a psychotherapist where I have seen a lot of men going through big changes in their lives – usually involving heartbreak or a bad relationship or the inability to form one – and so I suppose I know a fair bit about how guys tend to respond to their feelings. I found it quite liberating actually to be writing from a non-female point of view for a change! You have worked with Anglia Television and as a therapist as have two of your characters. How heavily do you draw on your own experiences in your writing? Well, it’s true that I know what it is like to be part of the big family that forms a television company and I’m sure that that sense of a supportive network is in the book and colours the experience of two of my characters. I also, as you say, know what it’s like to be a therapist, and – like one of my protagonists – to feel uneasy when treating patients whose behavior is unpleasant, even though it’s your job to offer them unconditional respect and regard as people. I also have a Catholic priest in the story, so it is probably no surprise that I am a Catholic myself. And I have a freelance singer among the characters too, and I know very well what a precarious life that can be as I started off with a career as a classical musician myself. So, I think mostly I write about what I know. And I certainly locate the narrative in places I’m familiar with, and love. This book appears to make a number of political statements. Was that your intention when you began to write it? No, not at all. I began sketching it out before my last novel was actually published but then we had the EU referendum in this country and that changed everything. I felt I could hardly write a contemporary novel if I ignored such a huge happening. And my characters clearly agreed with that. I feel we’re living in a different world from the one in which I brought out my ‘romantic comedy’ novel in early June 2016. I’m really not sure about this. Maybe readers can spot influences that I’m unaware of. But there are writers I admire whose new titles I never miss. I would love to think some of their magic dust might rub off on me, just a tiny, tiny bit. The first author I must mention is Helen Dunmore because – as many of you will know – she died recently. I feel overwhelmed with sadness that she has gone at such a young age and with plenty of books left to write. Other great favourites are: Kate Atkinson, Elizabeth Buchan, Robert Harris, William Boyd, Patrick Gale, Julian Barnes and John le Carré. Do you plot your books out carefully? Increasingly, I am inclined to let the characters take over – they certainly have in It’s Who We Are. I had, for example, planned that one of them should die, but when it came to it, the story went off in an entirely different direction. What I do plan meticulously is a time line – so I am absolutely sure what happens on what day, even if I don’t spell this out in the story. Also, I go through loads of images till I find pictures that seem to me to represent my main characters. This fixes my vision of them in my mind. And I write an extensive back story for them too. I wish I could tell you! There’s a lot going on in my family life at the moment, which has cut down the amount of hours I can allocate to my own work. So, I just grab time when I can. Essentially, I do social media and emails and marketing first thing. Mostly then, I go out to an exercise class of some kind. I write in the afternoons almost every day – and sometimes manage to carry on for a while in the evening too. Which part of producing a book do you enjoy most? And which do you most dislike? I absolutely love editing. Once that first draft is done, and I can really get on with making it as good as I can, then I am in my element. I find the initial laying down of the story difficult – though I don’t hate it. After all, I’ve chosen to do this! Well, as you undoubtedly know, the lead up to a publication date is quite frenetic, no matter how much thinking you’ve done about your promotion and so on beforehand. I had promised myself that as soon as we were into 2018, I would carve out time to start my new book. It’s the 5th January as I write this, and I have not had a moment to even think about the new novel I’m planning, because I’ve been working solidly on trying to get the word out about It’s Who We Are. But I can tell you that I plan to re-issue my very first novel, In Honour Bound, this summer. I need to get on with that. And my new book is going to be about three characters, all in mid-life (there’s a surprise!) and all female. I think that’s all I can tell you for sure. I’m looking forward to it, Christine. I found It’s Who We Are to be a lovely tale with an eclectic cast of characters who blend seamlessly together. Set in England, the aftermath of the Brexit vote, it explores the lives and loves of five very different characters linked together by an unusual thread of coincidence, and the challenges of aging. It’s a compelling story about real people facing real issues. I loved it! You can buy a copy of Chritine’s book here. I was surprised to see there were not hundreds of responses, until I realised my time machine was working, and it’s still half an hour until the blog is published. Fascinating interview and the very best of luck with your book Christine. This sounds like a great story. I would love to read the story. Thank you for the info. Sounds like a lovely book. I look forward to it. I can’t wait to read It’s Who We Are! I would love to win your book. I would review. I loved reading about Christine’s process. I especially liked the image of her going through loads of pictures to try to ‘find’/put a face to her characters. And it’s very interesting to me, as a ‘wannabe’ writer, how her characters then take on a life of their own, and somehow almost tell their own story! Amazing! Thank you! Delightful interview. Well done, Maggie and Christine. This book is on my TBR list. Thank you for this wonderful interview. I like that the books about a little older group of people that sometimes get overlooked. And having second chances is what sometimes hits that age range. Thank you. I enjoyed this interview and learning about Christine’s writing process. I also like that you search for images of people that look like your characters and then write their backstories. I look forward to reading your book about people my age. I have much more in common with the characters! Thanks Maggie for introducing me to another author who writes in the same style as your books. This book sounds really interesting and very relatable to my age group set in contemporary times. I shall add this book to my TBR pile ? and is certainly more relatable. I will look forward to a great read and best wishes for the sequel of ‘The Good Sister’ can’t wait!!! Oh how I enjoyed reading that interview. Most informative and interesting. I shall look forward to your book as it is so nice to read about the antics of older people. We can all relate to some of the issues raised in your books and also those of Maggie Christiansen. Brilliant and easy to read – most enjoyable. Thank you ladies! Sounds like a book I certainly would enjoy! Can’t wait to read it, hope I win!